MANIK FARM, SRI LANKA, May 23 -- Beside printed banners welcoming the UN's Ban Ki-moon to "the motherland," Tamil children were paraded on Saturday with Sri Lankan flags, singing a high pitched chant, "Ban Ki-moon, Ban Ki-moon." While many found it ghoulish, given that these children are interred in these UN funded camps along with their families, Mr. Ban gamely smiled through it, taking a tour of the militarized camp with Sri Lanka's foreign minister. Later he was taken to an open-air hospital, where severely ill elderly people lay writhing in pain, flies all over them. Ban bent down and held a woman's hand, while the woman next to her looked, frankly, dead. A cameraman on this gruesome tour stepped on woman lying with an IV on the ground, without noticing. Ban stood and whispered an interview to the BBC. "We need to go for the fly-over," a security officer hissed. "He's speaking to the Press," a Ban handler replied. This is important. The fly-over was pushed back. The now-empty lands from which these people came could wait. A husband stopped the Press to show his wife's thigh, cut by a government artillery shell. We need help, he gestured. But to name him might result in even more problems. A woman gave an interview through barbed wire to a gaggle of reporters, translated by a UN staffer from New York who helpfully spoke Tamil. She gave her first name, and complained that they can't leave the camp. Then the soldiers told her and the crowd around her to back away from the fence and media. A reporter called after her, "what is your last name?" She looked worry before giving it, so Inner City Press does not print it. What is the UN's role in these camps? Why do they let the Sri Lankan government use UN Photos of Ban and Rajapaksa for propaganda banners? How should Ban react to the forced singing of his name? 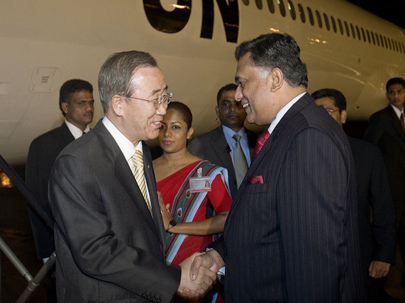 Earlier on Saturday, Ban Ki-moon and his officials received a one-way briefing from Sri Lankan interment officials. In a meeting room with two slow turning ceiling fans and a multitude of armed guards, three speakers berated Ban and his top humanitarian and political officials about how much they are doing for the people they displaced, in large part. The government speakers chided the West for lack of aid, said that India (and in one previously reported Kouchner case, France) were alone with medical help. Later Ban was shown some blue tents and told, these were given by China. Ban nodded and later said, we have to help the Sri Lankan government. During the one-way briefing, Inner City Press said after one speaker, "Can we ask questions?" Ban's officials turned and looked, but the government continued with its endless Power Point presentation, about bank branches and book sales. Then a Ban handler told Inner City Press to leave the hall and go to the minibus. Outside, soldiers told photographers to put down their cameras. When one reported approached the barbed wire to speak to those behind it, it was representatives of the UN who said not to do it. Perhaps this was wise and protective. But why then is the UN funding these camps? ...There is no real push-back to the exclusion of vehicles from the IDP camps. The minutes say that ICRC (the Red Cross) "backed down." While some UN sources have told Inner City Press that UN staff are threatening a de facto boycott, Holmes told the Press on the plane ride to Sri Lanka that this is not the case, that access and work continues. It appears that the Secretariat may not even push to have Ban Ki-moon briefing the Security Council upon his return to New York. Then again, in April Ban Ki-moon was only in New York three times, for a total of five days. A lot is being "phased out." Inner City Press will be accompanying Ban and Holmes on their whirlwind tour May 23 and will report on it in real time to the degree possible given the host country's control of the tour and the lack of internet access. Watch this site.